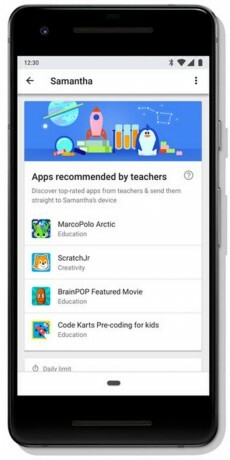 Google hopes a new feature in its Family Link app will help parents find apps that are recommended by educators. Google says it is adding a new card to the Family Link app that highlights what Google calls "nutritious" apps, or apps recommended by teachers. Parents can read more about recommended apps on their own phone and then tap to download those they approve to their child's phone or tablet. Google says the new Family Link card is available in the U.S. with a focus on apps for kids ages 6 through 9. Google expects to expand the tool to more countries over time. Verizon Wireless today announced the GizmoWatch, a second-generation smart wearable that targets children ages 3 to 11. The device is primarily meant to serve as a location tracker for parents. Google today announced Family Link, an app and service parents can use to set up and monitor Android smartphones for their children. Parents can use the app to create Google accounts for kids younger than age 13, which is linked to the parent account.